Last night at 11:29, we heard a loud noise from the street, like a string of firecrackers going off. Then the power went out. We suspected a tree had gone down, or maybe a car went off the road. The sound was more like the crackle of a tree coming down, but we weren't that excited about going exploring in the dark and rain with power lines likely down. We reported the power outage and found out we were the first to report the outage. As Cathy spoke to the technician, more reports started rolling in. We have a natural gas generator, so the lack of power is only a minor inconvenience. We powered down to the bare minimum and unplugged the computers and went to bed. During the night we heard chain saws running, multiple times, and the beep-beep-beep of big trucks manuevering. In the morning the power came on and went back out, then returned to stay around 9:00. After breakfast, we were ready to go check out the situation. 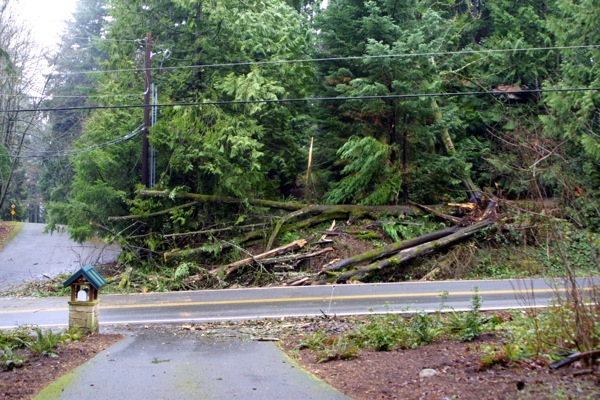 It's definitely better to look at downed trees in the light and after the power lines have been fixed. Here's what we found at the base of our driveway. A tree with four trunks all came down, at least some of which crossed the road onto our drive. One of the pieces fell away from the road back toward the houses on the other side of the street. You can see it leaning away from us in the above photos. 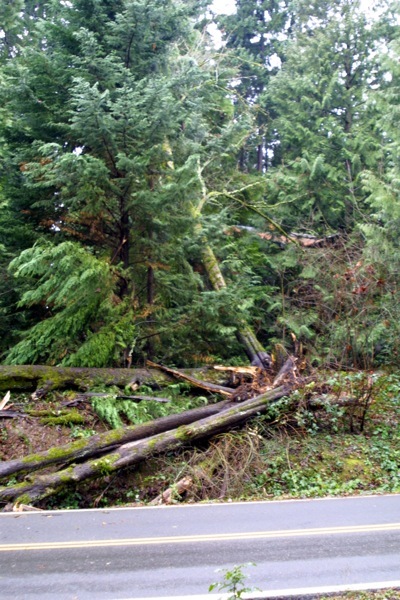 Fortunately, it just crossed the drive and fell against another tree. It doesn't seem to pose any threat to the homes back there. On our side of the road was just a little debris with some evidence something made it to our side. One of our reflector poles got broken off. Since it was the one on the inside, it seems like it was a tree falling and not the clean-up crew that smashed it. 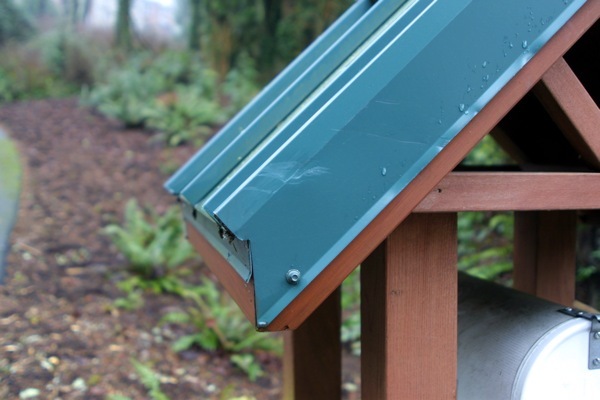 There's also a very slight swipe mark on the roof of our mail box stand. While we were down checking out the aftermath, a neighbor from the developement across the street, and down the hill a bit from the mayhem, told us his story. He was coming home last night (from picking up his son at the airport) and saw the flash when the tree stuck the power lines. 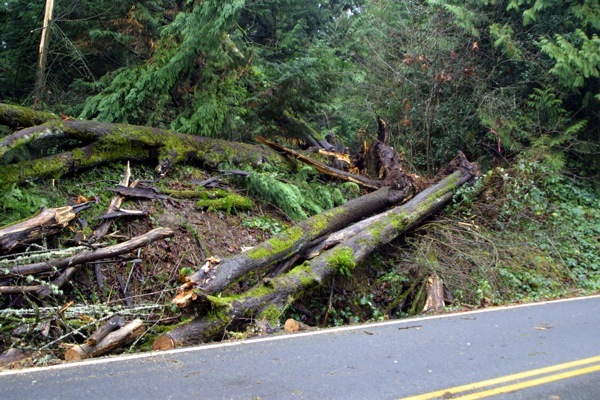 He called 911 to report the traffic hazard (the trees were across the road on the downhill side of a blind curve which many people speed through). The tree hit the power lines and pulled this power pole over the yellow lines on the road. Police were on the scene very quickly, followed quickly by the utility folks. The signs and cones left on the sidewalk must have been used to block the road while the trees were cleared and the power lines repaired. It's good to live in a country where stuff like this just gets taken care of. 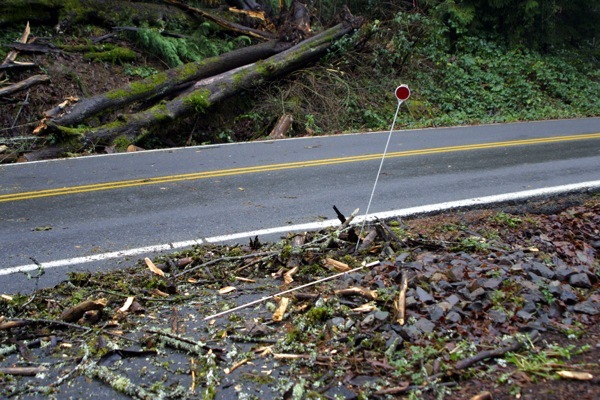 It's also good to not be driving on the spot when a tree decides to fall on the road.